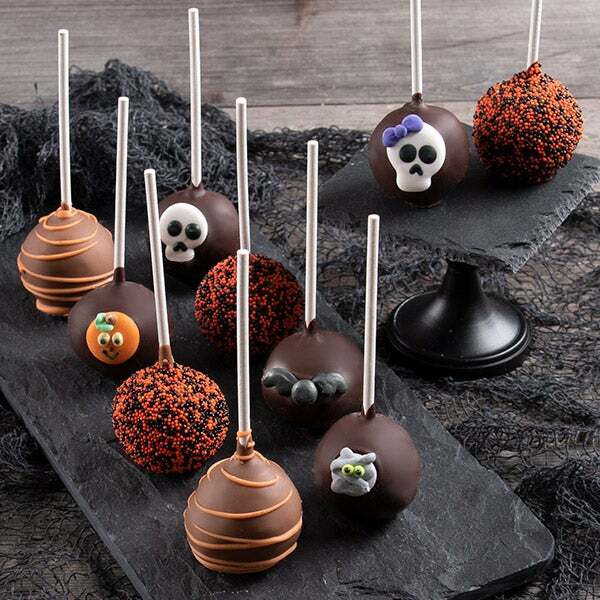 Halloween Cake Pops is rated 5.0 out of 5 by 3. Rated 5 out of 5 by Boat boy from Great Halloween gift! A fun surprise! These were a hit at UMAS Amhearst for Halloween! Rated 5 out of 5 by Ellen from Great product Bought these for our grandsons. They are 4 & 17 mos. old. They loved them. Rated 5 out of 5 by drsusan from Loved by recipient! I gave these to a friend who's in rehab after surgery...she was thrilled! Loved the way they looked and raved about the taste. These adorable cake pops are so good it's almost scary! We've taken our sweet vanilla and rich chocolate cakes, baked them into bite-sized balls, and then carefully dipped them by hand into baths of smooth imported Belgian chocolate. Each treat is then embellished with either a silky confectionary drizzle, tiny nonpareils, or adorable Halloween-themed candy appliqués.